I have a question if you'all can answer it which I'm sure someone here can. youtube with the Baddadz, lookup Baddadz 1991. Is it an Omega what or what? It's had a few mods to it, Tuners,Bridge,Knobs,Tailpiece & EMG 81/85! Last edited by vabeachf150 on Wed Feb 01, 2012 7:08 am, edited 1 time in total. 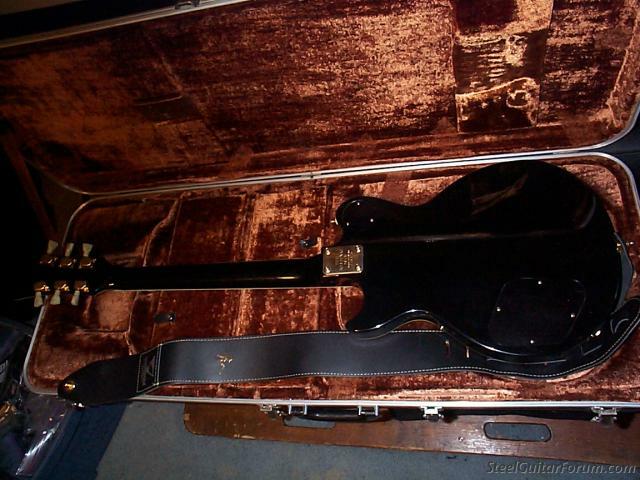 If it has a bolt-on Neck, it is a 2244 (possibly 2242) Super Rock. The Super Rock was historically a LP copy, although it's last version was like yours with the one-and-a-half cutaway body style, less common than the LP body shape to be sure. If it has a set neck (glued in), I'm not sure what to tell you, as the Omega's had Trapezoid Markers typically. Your Tailpiece, nut, pickups and knobs have been changed, just for your curiosity. The Truss Rod Cover is correct, and would date it approximately from 1978-1980. Congrats, and welcome to the Forum. Obviously this is NOT a 2242 or 2244 as they have a LP style body. Sorry dude but NEXT authority? Geez Really. C'Mon fellas this is supposed to bne an Electra Forum. Take a good look. Umm - I hate to burst your bubble but proendorser - as usual - is correct. Bolt on neck equals 2244 maybe 2242. NOT an Omega. Does the body have any belly cut? Post a picture of the back of the body and the back of the headstock. Either way, I wouldn't say it's extremely rare. Certainly not seen every day but they do pop up from time to time. For the record you won't find anyone better than proendorser when it comes to identifying Electra models. $75 is a great deal for that axe. Nice find and welcome to the forum. [quote="vabeachf150"]Obviously this is NOT a 2242 or 2244 as they have a LP style body. Sorry dude but NEXT authority? Geez Really. C'Mon fellas this is supposed to bne an Electra Forum. Take a good look. Hey "dude",let's be polite here-this is a very close community and Proendorser is highly respected on this board and has probably forgotten more Electra info than most of us know. Now, welcome and let's play nice. I must agree with my fellow forum members here. I understand that a vast majority of those were indeed LP models but the Omega models were all set necks as well as the anniversary 935 Pro Endorser models and all of that body style. However in the late and some od the last of the production runs on the 2242 models they did use that body style with the bolt on necks so Pro is indeed correct. You got a great guitar at a great price reguardless so enjoy it and Rock on. The 'Black Rock' pictured has dot markers as opposed to Block markers, but it was not uncommon to see discrepancies between the Catalog version and production models. The difference between the 2242 and 2244 is whether it came with chrome or gold hardware, both had Black finishes. One of the (endearing?) 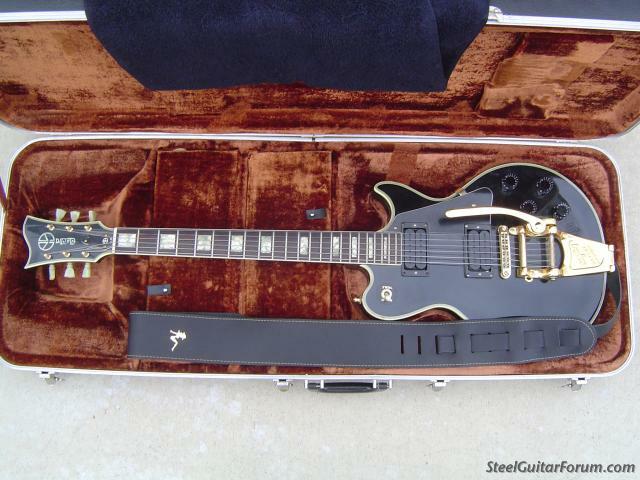 qualities of the Electra line is that specs often changed within the production run, although this had long term ramifications to players, and landed Electra with a 'Pawn Shop' reputation for the many variations. This has been good and bad for collectors... good because it has kept the prices down, bad because, well its kept the prices down! Cheers, Mike. In answer to your rarity question, there are no production figures published for any of the (over 100...) Electra Models, so we can only go on speculation or reasonable guesses from what we've noticed being offered for sale over the years. I'm with Jead and Arthur that they are seen from time to time, and not especially rare compared to some of the many other offerings from SLM. With it's modifications, I guess you could conceivably say yours is one of a kind though! I just noticed from the above time stamps that I ID'd this guitar thirteen minutes after the request... I apologize, I'll try to be faster in the future. Mike. Model is a 2242 /2 Designator. 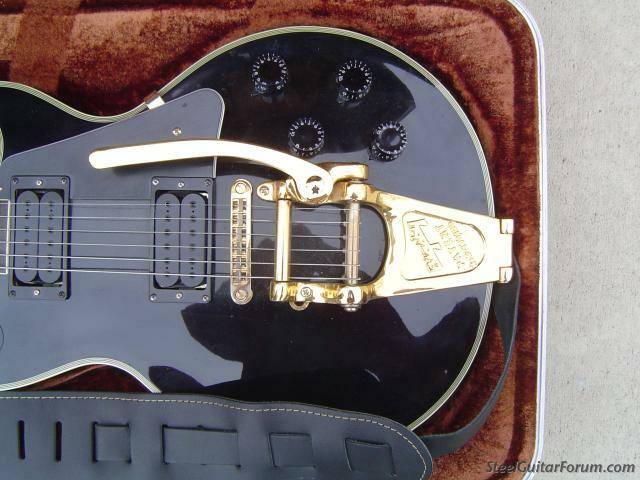 It was a transition model that moved from the standard LP style body to the quasi double cutaway. When we completed the X series for the Omega production, I already had paid for the "mold" for the body and top segments for the "new" production standard so I moved the LP bodies over to the new mold. Kasuga made the original 2242 and most of the original production at that time. After bit of time, I moved production from Kasuga to Matsumoku due to some political and product specification issues. Designators for the Matsumoku were 2242 /3M. Some of the designators showed up on the labels, others on the warranty cards. Most of the labels were torn off by the retail stores so it's really hard to get a handle on the "where it was made". Kasuga models all had "pressed" tops and wanted a ton of money to do carved tops. Matsumoku wanted the SLM relationship to assist in development of the Westone branding in the U.S. and supplied the LP styles with carved tops across the line. As a result, MPCs, Omegas and most other Electra later production models were moved from Kasuga to Matsumoku. Semis and Hollow Body instruments were moved to Terada. So, you can tell the Kasuga production only by looking at the top from inside the pickup cavity. If it is a pressed top, you'll likely see the top blocking or filler. If Matsumoku it is solid. Great information Tom. What a byzantine maze they were weaving in Japan back then! So if hollowbody models were Kasuga but MPC were Mats am I correctly assuming then that an x410 (JazzStrad) is Kasuga, but that the x810 (it's MPC cousin) is Matsumoku ? ...and since I'm being a pest, an x110 "open-book" is? ?